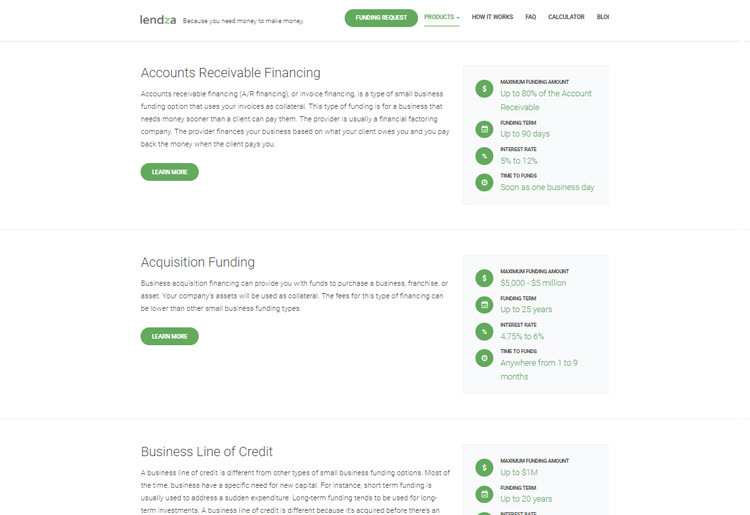 Lendza connects businesses with lenders offering many different types of loans, from traditional loans to merchant cash advances. A quick application process, fast turnaround times, and the potential for favorable rates and terms make Lendza a viable option for small businesses in many industries. A simple loan matching process cuts down on the time it takes to obtain funding. Lendza bills itself as a “well-seasoned” group with knowledgeable staff members experienced in the financial industry. Committed to creating “strong relationships” with providers, they have worked to create the widest possible network of business funding options. As a loan matching service, the company doesn’t provide loans directly to businesses. Instead, they use application information and their own “routing system” to pair companies with suitable lending institutions. Lendza is located in California and serves companies around the U.S. By providing funds for a variety of needs, the service is able to help businesses get started, grow, expand, or get back on track after tough times. 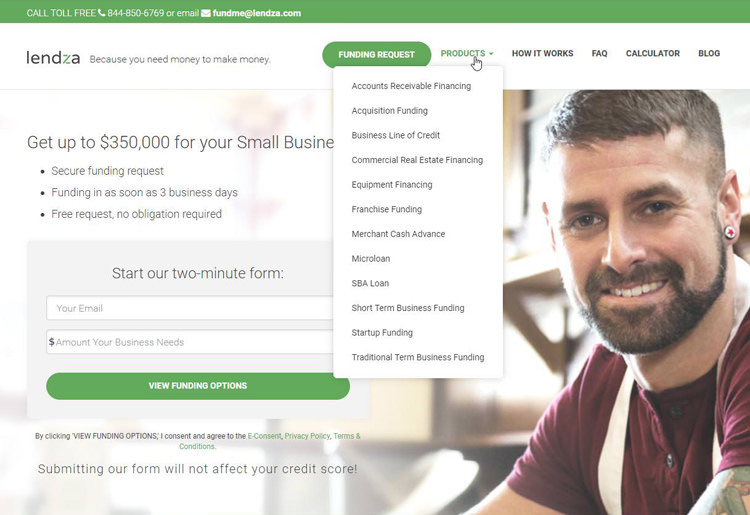 Lendza is a loan matching service designed to act as a bridge between small businesses and lenders. This structure makes it possible to access a diverse selection of lending options for your company, including traditional term loans, SBA loans, short-term funding, microloans, accounts receivable loans, lines of credit, startup funds, merchant cash advances, and financing for equipment and real estate purchases. Depending on your credit score, financial standing, and debt history, you could qualify for low interest rates and favorable term lengths for any one of Lendza’s funding options. Because they do the work of finding a loan provider for your company, you spend less time shopping around for a lender with suitable services and rates. Having a wide range of loan types available means you can go to them for money needed right away or for funding of future business purchases and plans. By taking the hassle out of finding just the right lender for your business, Lendza makes the loan process less stressful and provides the flexibility you need to cover a variety of expenses. Whether you’re looking to acquire a business, buy a franchise, expand current operations, or establish a financial backup plan for slow seasons, they can connect your company with a suitable lending institution. Loan amounts can be as large as $5 million for certain needs, such as purchasing an existing business or taking advantage of a franchising deal. Funding for some of these high-cost business opportunities is available in as little as two days, so you don’t have to miss out on a good prospect due to lack of cash. Other loan options, including merchant cash advances and lines of credit, are designed to help your business in times of need. These funding types provide quick cash or offer a buffer for you to draw on when unexpected expenses arise. Since Lendza provides loan matching services for 12 different types of funding, qualifications differ depending on the loan structure you request. Each lending option is described in detail on the site so that you can read up on how to qualify before starting your application. Some options require a favorable credit score, and others may look at your business experience, the value of your company, and overall performance. Thanks to the diversity of the loans offered, you have a good chance of finding an option tailored to your current needs. Most options can be selected from drop-down lists to make the application process faster. Lendza considers this information when pairing your business with a provider rather than offering you a loan agreement directly. Lendza’s approach to small business funding makes it stand out from other alternative lenders. Rather than providing loans to companies, this company acts as a go-between, using application information to find suitable lenders for a variety of needs. Through Lendza, you have access to a dozen different types of loans, cash advances, and financing options, and the company does all it can to pair you with the best lender for the type of loan you request. Although there’s a chance that no suitable lender will be found, the overall goal is to obtain a funding source for every customer. The application process has only a few steps and requires basic personal and business information. Once your funding request has been received, they look for providers and contact you with the available options. You choose which lender you want to borrow from, and you continue to work directly with the lending institution. Loan providers may ask for additional information and paperwork regarding your business, and you may be required to fill out detailed applications. All funding is obtained through lenders, so any financial agreements you enter into are between your business and the loan provider, not Lendza itself. 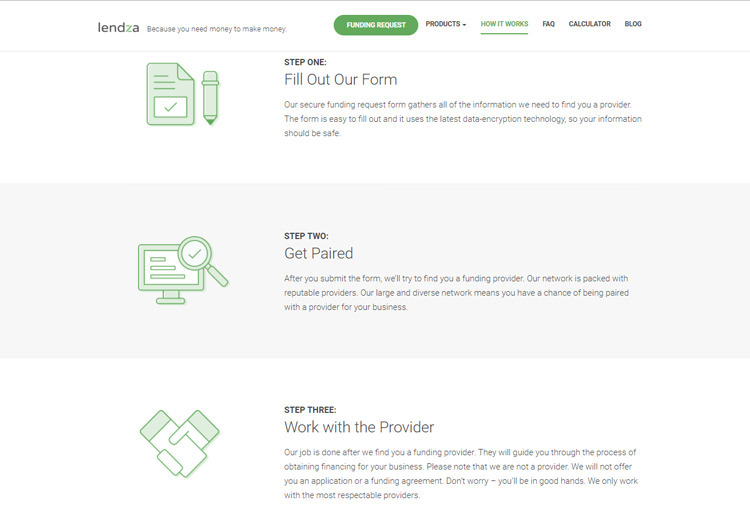 You are given detailed information about every type of funding offered by their network of providers. This gives you the opportunity to research which loan or financing option is the right one to handle your company’s expenses. Lines of credit are the most flexible in terms of how funding can be used. Other loan types require you to specify what the loan is for so that they can pair you with the appropriate provider. While the requirements aren’t as stringent as those for bank loan applications, you have to differentiate between startup funds, emergency cash, and funding for certain purchases to get recommendations relevant to your needs. Because they partner with a variety of lenders and are continually growing their network, they’re able to serve a diverse range of businesses. Whether you’re an entrepreneur with only a few employees or you’re looking to expand an already successful venture, they can help you get the money you need. Most business owners don’t have time to look into every possible lending option, and requesting funding through Lendza grants access to an expanded selection of providers. The service may be able to discover a lender you wouldn’t have found on your own. To get the most out of what they offer, you have to spend some time researching the different terms, rates, and requirements for the lending options you wish to pursue. You may discover that you don’t meet the qualifications, or you may be able to request more money than you first thought. You should also be aware of how long the funding takes to be approved and delivered. While options such as merchant cash advances and accounts receivable financing may take only days, more complex loan types can take several months. However, this variability can be beneficial for businesses with changing financial needs since you can use Lendza for both immediate and long-term funding. Terms, rates, and fees for funding through Lendza’s network of providers vary between lending options. Interest rates start at 2.5 percent and can be as high as 60 percent. Short-term funding offers payback periods of up to five years. Traditional term loans and other long-term funding may allow up to 25 years to pay back the principal. Some short-term lending options have small windows of time for repayment, making the average interest rate higher and putting you at risk of missing a payment if you don’t budget properly from the start. Payments are handled by the provider with which Lendza connects your business. This means all fees, terms, and payment scheduling are handled through an affiliate in their network. After being paired up with a lender, you deal directly with them throughout the rest of the loan process. Lendza can only provide basic information about loan rates and doesn’t control the payment conditions of lenders in its network. Although Lendza works to find the best provider for your business, it’s up to you to pay careful attention to the nature of the final loan agreement. Make sure you understand the payment structure and can handle the monthly obligations before signing off on anything. Lendza uses 256-bit secure socket layer (SSL) encryption to transmit data and offers additional protection with firewalls and proprietary authentication methods. The personal information submitted during a funding request is only shared with Lendza employees and affiliated institutions as needed to determine the best lender for each customer. Lendza offers customer support via phone and email, both of which are listed on their site along with a direct contact form. For more detailed inquiries, you can send a letter to the physical address provided in the website footer. Quick answers to common loan questions can be found on the FAQ page, and the company provides detailed information about each loan type in their “Products” section. This includes the pros and cons, specific qualification requirements, and expected terms and interest rates for different funding types. Before applying for a loan, you can use the online calculator to determine monthly obligations on the amount you need at various interest rates and term lengths. This can be useful in determining whether you can afford a larger loan or need to scale back your request. 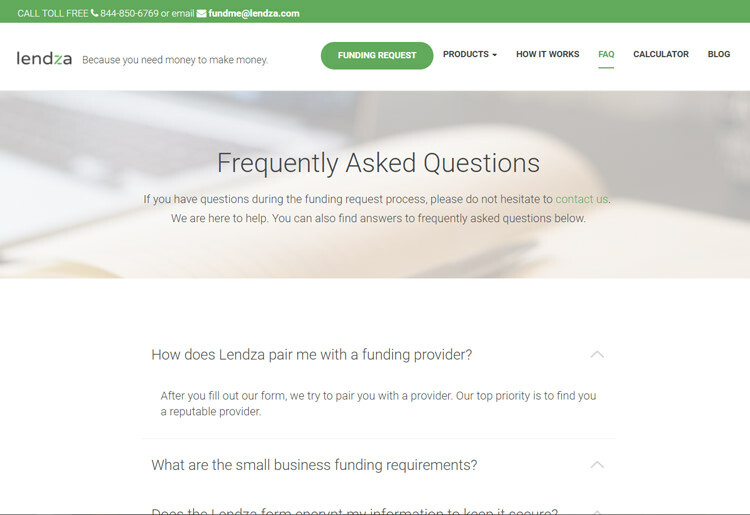 Since Lendza doesn’t directly provide funding to companies, they don’t offer support for any funding agreements you enter into with third-party lenders in their network. For help with your final loan agreement, you have to get in touch with the provider directly. By working with a large group of funding providers, Lendza is able to connect businesses with lenders offering many different types of loans. Companies looking for everything from traditional loans to merchant cash advances can request funding through this provider to discover all available options. A quick application process, fast turnaround times, and the potential for favorable rates and terms make Lendza a viable option for small businesses in many industries. The loan matching process cuts down on the time it takes to obtain funding and provides a better chance of getting the money you need than if you tried to approach multiple lenders on your own.